With the summer months well at hand, trips to the beach and lake will become more frequent. The risk of exposing your Windows Mobile device to water becomes greater as you enjoy that boat ride or sun on the beach. Aquapac offers a range of water proof bags that claim to keep your phone high and dry while allowing you to use the phone while it is safe and sound in the case. Will the Aquapac Form Fit Case ($24.95) float? Read on for the full review and found out! Out of the box the Aquapac feels not much more than a heavy duty Ziploc bag that has a bit of padding to it. The closure is sealed securely by two plastic plates that lock together forming a waterproof seal. 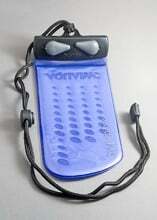 The case can be worn by an included lanyard, attached with a clip hook or carried free form. In using the case with a Samsung BlackJack II, the phone slides into the case without difficulty. There is plenty of room left over to accommodate a key, credit card or cash. Lanyard carry is comfortable but can grow tiring. The hook carry is just uncomfortable. But then again, this is a specialized case not designed for everyday use. You can manipulate the keys of the phone through the case and surprisingly you can actually use the phone without taking it out of the case. I could hear callers just fine and my voice was described as muffled but understandable. I have tried to use the BlackJack II with a generic waterproof bag but it muffles both the earpiece and microphone too much. So, how water proof is this case? In wearing the case while operating a personal watercraft, it kept dry as a bone. It was splashed considerably with no leakage detected. In a sink test (filling a sink with water) the case floated and stayed dry inside. 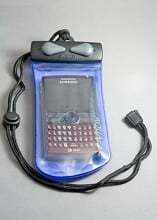 The contents of the case stayed dry even when the Aquapac was submersed in water. Taking the phone out of the case was a little bit of a challenge. The plastic became a little tacky and stuck to the phone a bit. There was no residue left on the phone but it did make it a little difficult pulling the phone out of the case. The Aquapac Form Fit Case ($24.95) offers waterproof protection for your Smartphone as well as a level of cushioning. If you are headed to the beach or lake this summer and are concerned about keeping your phone safe and dry, the Aquapac would be a good choice.